Coming to the second day of this month long marathon, I have a bread which is very quick, easy and healthy. This is a bread which I had bookmarked long back from Gayathri's blog.The bread is very flavorful and I served it with some cheese spread. I was shocked to see the bread disappearing in minutes. The onions, poppy seeds and the sesame seeds all lend it a very unique flavor. I was impressed with my self, if I may say so. Add onions,garlic and green chilly, Saute till pink. Add the chopped spinach, let it wilt. Add poppy seeds and let them roast. Mix 1/2 cup oil, milk,and curd . In another bowl mix together flour, baking powder and salt. 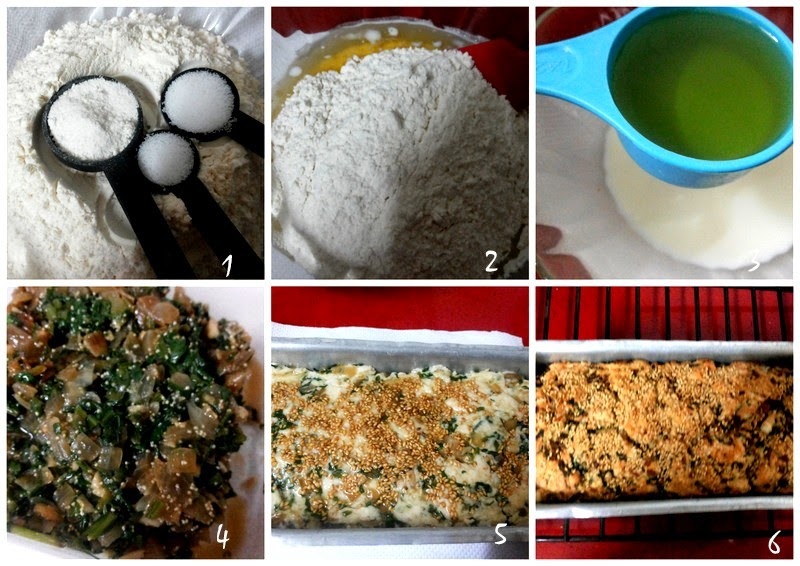 Add the flour mix and the sauted spinach mix. Grease a 9x5" loaf tin with oil. Drizzle the 1 tbsp oil over the batter. Bake the bread for about 50 minutes or till the skewer comes out clean.